Establish a Development Impact Fund to pilot outcome-based aid models with 10 percent of existing development agency programmatic budgets. Increase the share of funding spent through outcome-based funding models within USAID, the Millennium Challenge Corporation, and other US development agencies. While global development is about much more than aid, US foreign assistance is, and will remain, one of the most visible tools for US development policy in many countries. The US government spends less than 1 percent of its annual budget — about $23 billion — on nonmilitary foreign assistance across the globe. These programs have consistently come under fire for failing to achieve measurable and sustainable results, ignoring local priorities and contexts, perpetuating bureaucratic inefficiencies and inflexibility, and repeating mistakes over time. A paradigm shift within US aid agencies is needed. In this brief, we outline concrete proposals that would address many of the traditional shortcomings of US foreign aid approaches. The common theme across these proposals is an overriding focus on financing outcomes (like increased agricultural yields) rather than inputs (buying fertilizer). This would ensure that the United States spends taxpayer money only when our development partners actually deliver concrete, measurable results. For example, it does not matter how many new textbooks the United States provides if children still cannot read at the end of the school year. If more of our scarce US aid dollars were paid in proportion to the achievement of outcomes, we could avoid many of the risks associated with traditional foreign aid programs. This would require channeling some funding through new mechanisms but would not change US development agencies’ objectives. The next US president has a unique and timely opportunity to encourage an innovative, adaptable, and efficient approach to US foreign assistance — one that is driven by outcomes. In the first 100 days of the administration, the US president should announce and launch a Development Impact Fund. The fund would commit itself to paying for outcomes that are of interest to both the United States and recipient countries. It also would build a knowledge base to support ongoing projects. In addition, the fund would integrate the strengths of an outcome-driven model into US aid agencies’ core business models, thereby reforming them from the inside out. Flexibility: With most development assistance, funding for a project is obligated up front. Project designs are developed in advance of implementation and often include detailed procurement plans. The intent of standardized processes is to prevent waste, but a side effect is rigidity. Project designs are rarely modified even when midterm evaluations suggest unsatisfactory progress. Redirecting the focus of assistance to development outcomes would incentivize adaptation. If an early strategy adopted by an outcome-based project is not having the expected effect, implementers would have the flexibility to return to the drawing board since the US agency funding the project only pays for what works. This provides an important opportunity to learn from both mistakes and successes in the field. Recognition of Local Context: When traditional aid projects claim success, there is often immediate pressure to scale up and replicate. This response ignores the fact that even the most successful models do not work everywhere. Different contexts — such as cultural norms, political and societal structures, and policy environments — often demand different solutions. Outcome-based funding builds in the potential for local solutions and forms of collaboration that can help ensure that projects reflect unique local conditions and needs. Creating Demand for Rigorous Evaluations: Not all evaluations are created equal. Assessments completed in the interest of checking a box offer few lessons for improving current and future aid activities. Since outcome-based payments depend on achieving independently verified progress, there is a strong incentive for rigorous measurement of and learning from what really matters: development results. 4. Reducing Waste: The United States would pay only for results. This would allow the US government to be clear with taxpayers about what their scarce resources deliver and foster a fundamentally different discussion with the American public than what occurs today. Outcome-based funding approaches can take many forms. Below we first outline two specific variations: Cash on Delivery (COD) Aid, which can be implemented by US aid agencies in partnership with developing-country governments, and Development Impact Bonds (DIBs), which additionally leverage the resources of the private sector. We then propose options for US implementation in the form of a Development Impact Fund to support both types of outcome-based funding projects. The donor pays only for an outcome. The recipient government has full responsibility for and discretion in using funds. The outcome measures or units of progress are verified independently. The contract, outcomes, and other information are disseminated publicly to ensure transparency and accountability with both local and US stakeholders. The funding complements other foreign aid or domestic resources. COD Aid is designed to improve accountability and transparency in development spending, in both the sponsoring and recipient countries. Recipient governments would be primarily accountable to their citizens for delivering the services that they need, rather than to US aid agencies for implementing a plan that was funded up front. This shift in accountability would encourage good governance and strengthen domestic resource systems through the use of recipient countries’ existing budget and procurement systems. COD Aid can also reduce corruption because it is harder to manipulate independently verified outcomes that are publicly disseminated than it is to mislead procurement and audit systems, which operate in relative obscurity. In turn, US aid agencies would be more accountable to US taxpayers because payments would reflect the achievement of strategic outcomes. This would allow the US government to be clear with taxpayers about the outcomes that their scarce resources deliver. In addition, rather than valuable resources and time being spent on monitoring processes, resources and time would be spent solely on measuring achievements and on providing technical assistance when there is demand from recipient countries. Under a COD Aid agreement, the US government and a developing-country recipient would decide upon the outcomes they want to achieve; how outcomes will be measured and independently verified; and the amount to be paid upon achievement of outcomes, where possible a fixed amount for each unit of progress (e.g., each household that gains access to safe, reliable running water or electricity). It is a straightforward agreement that obviates the need for the compliance and control systems that are ubiquitous features of current aid agency systems and add layers of bureaucracy, thereby constraining creativity along with real-time iterative program improvements. The current implementation of COD Aid agreements by the UK’s Department for International Development creates opportunities to adapt lessons for US aid agency purposes. such as teacher training, textbooks, and scholarships. Shared Goal: All 12-year-olds should be able to read simple paragraphs and do basic arithmetic. Payment: The funder pays $25 per additional literate and numerate child relative to a moving average baseline. Transparency: The ASER test is administered by independent groups in open community settings. Scores are posted to a website by smartphone entry. Random retesting occurs to assess reliability. information on ASER, see www.pratham.org/programmes/aser. Implementing outcome-based funding programs would also demonstrate that the US government is taking concrete and transformative actions to execute its international commitments to increase country ownership, focus on results, and promote mutual accountability to improve the effectiveness of development spending. These commitments have been made by Republican and Democratic administrations over the last two decades. access to electricity throughout Sub-Saharan Africa. potential variations as illustrative examples. Shared Goal: All households should have access to reliable and adequate electricity services. Indicative Unit of Progress: A household with access to electricity for an average of 23 hours a day, adequate to power five basic appliances (e.g., television, refrigerator, stove, air conditioner, and lighting). Payment: The funder pays $100 per additional household relative to a moving average baseline. Transparency: An independently administered nationally representative household survey is carried out, with results posted to a website. Shared Goal: Reliable and adequate electricity services are available to consumers through financially sustainable utilities. Indicative Unit of Progress: Appropriately billed and collected electricity revenues; that is, revenues derived from (a) electricity delivered as demanded by consumers, (b) properly metered consumption, (c) consumption invoiced, and (d) invoiced amounts collected by the distributor. Payment: The funder pays $1 for every $5 in appropriately billed and collected revenues. Transparency: Financial and administrative reports are cross-checked by periodic and random visits to collect information from consumers on consumption levels, billing, and payments. There are several reasons why COD Aid models will not always be appropriate or feasible in developing countries. First, developing-country governments or implementers may not have adequate financing to cover program costs up front. Alternatively, US aid agencies may not want to transfer all or most of the inherent performance risk to a recipient government. In these cases, DIBs offer another engagement model for US aid agencies to promote outcome-based development activities. Under a DIB, there are three key actors (see figure 1). First, private investors provide risk capital in the form of prefinancing for a program. This money is channeled to the second actor, the ultimate service provider. If the program achieves the desired outcomes on the basis of independently verified evidence, then the third actor comes into play. This so-called outcomes funder (e.g., USAID, possibly in conjunction with the recipient-country government) would return the private investors’ principal with a financial return that is proportionate to success. Intermediary organizations typically would play a coordinating role among these actors or manage the performance of service providers on behalf of investors, if not both. Under a DIB, the private investors provide implementing organizations with flexible funding, which creates the space for these organizations to be more innovative and make modifications based on program implementation results and real-time challenges. Since investor returns are tied to pre-agreed outcomes, DIBs create incentives to establish the necessary data systems and feedback loops to monitor results and create a more bottom-up and client-centered approach to service delivery. This model can be a new and effective platform for public-private partnerships that transform development challenges into investment opportunities. DIBs build on the model of Social Impact Bonds, launched in the United States, the UK, and other developed countries, that have attracted private-sector funding and expertise in pursuit of effective solutions to social problems such as inmate recidivism and homelessness. The first DIB, which aims to improve education access and quality for girls in Rajasthan, India, was launched in June 2014. Many other DIBs have been proposed or are in the design phase; the UK Department for International Development is exploring using DIBs to reduce sleeping sickness in Uganda and to improve education in Rwanda. The next presidential administration should establish a USAID fund that would develop and manage a portfolio of outcome-based funding projects, such as COD Aid and DIBs. Outcomes supported by a dedicated fund could cover a range of development goals and include country-based priorities or could be linked to the achievement of the new post-2015 global development goals. Initially, the fund should focus on select demonstration projects. Testing these new approaches would be a low-cost undertaking for US government agencies, which pay only for successful results, and would demonstrate a commitment to country ownership, rigorous evaluation, and development effectiveness. Once fully running, the fund would demonstrate the potential of outcome-based funding, producing effects well beyond its direct outflows. As the base of knowledge grows, it also will encourage greater emphasis on results within US agencies, both culturally and through an eventual institutional shift to more dedicated outcome-based funding. To pursue this ambitious and transformative objective, we outline two specific implementation options. 1 Bilateral option: Establish a Development Impact Fund. Formal Budgetary Line Item: Under this approach, the next US president would call on Congress to formally establish the Development Impact Fund through legislation. This could occur through a broader foreign aid reform bill or through provisions added to a preexisting legislative vehicle. US aid agencies — in partnership with developing countries, the private sector, and other development recipients — would propose projects. The best ones would receive funding from the Development Impact Fund in the form of commitments to pay for the outcomes of successful multiyear projects. A modest portion of the fund could also be used to provide design and implementation support for outcome-based funding projects. OMB Allocation: The administration, with active involvement by the Office of Management and Budget (OMB), could instruct relevant US development agencies to allocate 10 percent of programmatic funds for outcome-based approaches. The Development Impact Fund would begin as a virtual aggregate of these programs. While this would not require congressional action, the administration should proactively consult with key congressional leaders and committees to secure bipartisan support. This will be essential for institutionalizing this new approach and would allow for a formal budgetary set-aside in the future. Regardless of the specific approach, the Development Impact Fund should be structured to ensure sound financial management practices. As with existing programs, the fund’s resources would be appropriated up front on an annual basis. The administration would establish a multiyear funding mechanism by which money that is committed to pay for outcomes in out-years does not need to be disbursed within the given fiscal year. The Millennium Challenge Corporation and some USAID programming have this multiyear funding authority. In most cases, funding would be disbursed during a two- to five-year period, which would allow adequate time for the achievement of agreed-upon outcomes. Moreover, US development agencies’ sector-based objectives (e.g., food security or child and maternal health) would remain unchanged. The central distinction is that budgetary resources would be allocated through innovative mechanisms such as DIBs or COD Aid contracts to drive an emphasis on results. Because of the critical focus on paying only for independently verified results, outcome-based approaches inherently create some uncertainty about whether disbursements will actually occur in out-years. This will invariably lead to congressional pressure to reallocate the fund’s balances for unrelated or emerging priorities or withhold further funding until appropriated resources are spent. To address these political challenges, USAID and other US development agencies could pursue a portfolio-based approach to managing actual disbursements. Some projects will disburse more than expected; others less. But pooling the commitments and projecting the probability of specific development outcomes would allow projected outlays to then be aggregated to provide a portfolio-level expectation of financial commitments, creating greater certainty across a broad range of contingent obligations. Budgeting across the entire portfolio would enable authorizations to align closely to disbursements. US aid agencies would regularly provide updates to the relevant appropriations and authorizing committees. Yet another option would be to pursue a first-to-succeed approach on a sectoral basis (i.e., a “prize” approach). For example, the fund would issue a global call for school learning outcomes to governments of developing countries. Then, the available US budgetary resources would be channeled to those partner countries that deliver verified results on a first-come, first-served basis. Alternatively, the fund could use a proportional-award system by making a global offer to eligible developing countries that are willing to establish school learning outcomes as the basis for outcomes payments. All US budgetary resources allocated to this outcome in a given year would be distributed to the included recipient countries in proportion to the outcomes they achieved that year. If structured appropriately, this approach would significantly reduce the likelihood of undisbursed balances in out-years while still only paying for demonstrable development outcomes. 2 Multilateral option: Establish a pooled DIBS Outcomes Fund. Another alternative for advancing outcome-based approaches to aid is to co-invest along with other official donors and private foundations in a multidonor DIBs Outcomes Fund. This fund would make resources available to pay for the results of successful DIBs. While DIBs are a new approach, pooling resources together to make funding readily available could help accelerate the implementation of pilot programs as well as encourage the sharing of lessons learned. This could catalyze reforms not only in US development practices but also in the broader global development community. Nancy Birdsall and William D. Savedoff. Cash on Delivery: A New Approach to Foreign Aid. Washington: Center for Global Development, 2010. Development Impact Bonds Working Group. Investing in Social Outcomes: Development Impact Bonds. CGD Working Group Report. London: Center for Global Development, 2013. Charles Kenny and William D. Savedoff. “Can Results-Based Payments Reduce Corruption?” CGD Working Paper 345, Center for Global Development, Washington, 2013. Ben Leo. “Can Donors Be Flexible within Restrictive Budget Systems? Options for Innovative Financing Mechanisms.” CGD Working Paper 226, Center for Global Development, Washington, 2010. W.A. Masters and B. Delbecq. “Accelerating Innovation with Prize Rewards.” Discussion Paper 835, International Food Policy Research Institute, Washington, 2008. Rita Perakis. 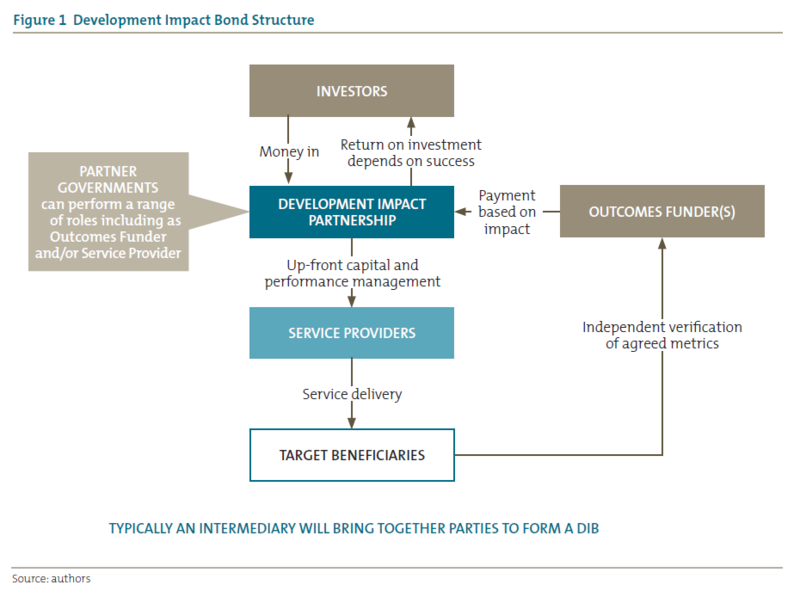 “Development Impact Bonds Briefing Note.” Center for Global Development, London, 2014. Rita Perakis and William D. Savedoff. “An Introduction to Cash on Delivery Aid for Funders.” CGD Note, Center for Global Development, Washington, 2014. For all CGD materials related to Cash on Delivery Aid, see www.cgdev.org/initiative/cash-delivery-aid. For other sectoral applications, such as water, see www.cgdev.org/page/application-other-sectors. See Charles Kenny and William D. Savedoff,“Can Results-Based Payments Reduce Corruption?” (CGD Working Paper 345, Center for Global Development, Washington, 2013). For a template COD Aid agreement, see Nancy Birdsall and William D. Savedoff, Cash on Delivery: A New Approach to Foreign Aid (Washington: Center for Global Development, 2010). For more information on the Department for International Development’s (DfID’s) implementation of Cash on Delivery or Results-Based Aid, which DfID refers to as one type of “Payment by Results” project, see project information for its first pilot in Ethiopia (http://devtracker.dfid.gov.uk/projects/GB-1-202989/) or these guidelines and a list of outcome-based projects DfID is funding: www.gov.uk/government/publications/dfid-guidance-on-payment-by-results-and-spreadsheet-of-pbr-projects. See, for example, the Paris Declaration on Aid Effectiveness and the Accra Agenda for Action (www.oecd.org/dac/effectiveness/34428351.pdf) and the Busan Partnership for Effective Development Cooperation (www.oecd.org/dac/effectiveness/­Busan%20partnership.pdf). For all CGD materials related to Development Impact Bonds, see www.cgdev.org/initiative/development-impact-bonds-0. The federal government currently has several Social Impact Bond–like programs, under the rubric of “Paying for Success” (www.whitehouse.gov/omb/factsheet/paying-for-success). Municipal governments, such as that of New York City, are also involved in Social Impact Bond projects (www.goldmansachs.com/what-we-do/investing-and-lending/case-studies/social-impact-bonds.html). The UBS Optimus Foundation is investing in the Educate Girls DIB, and the Children’s Investment Fund Foundation is the outcomes funder. Services will be provided by Educate Girls, a nongovernmental organization in Rajasthan. For more information, see the following blog post and news release: https://www.cgdev.org/blog/first-development-impact-bond-launched and www.instiglio.org/pub/EG_DIB_Press_Release.pdf. This time profile for disbursements is consistent with the Millennium Challenge Corporation’s existing approach, whereby projects are funded over a five-year compact period. For further discussion of this portfolio-based approach, see Ben Leo, “Can Donors Be Flexible within Restrictive Budget Systems? Options for Innovative Financing Mechanisms” (CGD Working Paper 226, Center for Global Development, Washington, 2010). The use of proportional rewards is mentioned in Birdsall and Savedoff, Cash on Delivery: A New Approach to Foreign Aid (Washington: Center for Global Development, 2010) and detailed for projects that raise agricultural productivity in Masters and Delbecq, “Accelerating Innovation with Prize Rewards” (Discussion Paper 835, International Food Policy Research Institute, Washington, 2008). See Development Impact Bonds Working Group, Investing in Social Outcomes: Development Impact Bonds, CGD Working Group Report (London: Center for Global Development, 2013).